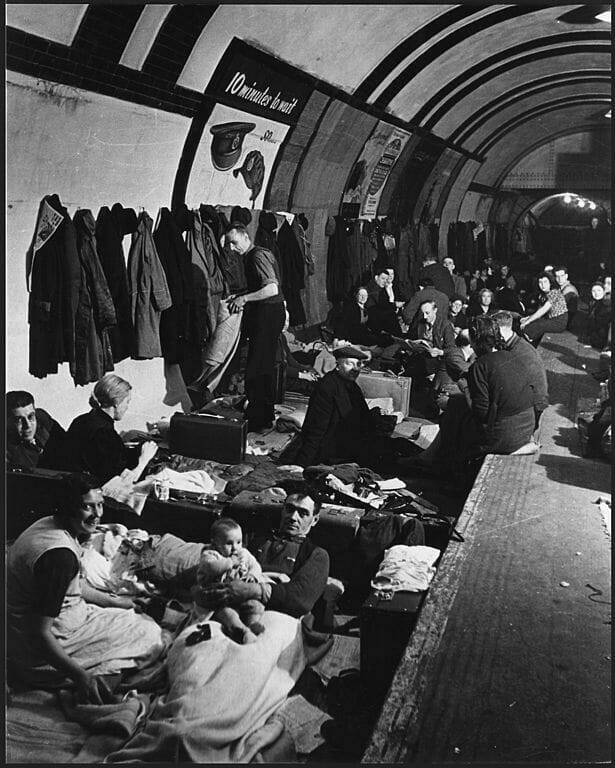 When we think about war damage in London, we tend to think about the Second World War. After all, the Blitz in 1940 caused significant damage all over the East End. Many civilians lost their lives, their homes and their places of work in the East End. This area was a natural target for bombing raids, as it was so close to the docklands areas that were vital to the war effort. But, this was just as true during the First World War. The Kaiser initially ordered Zeppelin bombing raids on the docks areas and then moved on to using aircraft carrying massive shrapnel bombs. Zeppelin raids tended to take place by night, but the later aircraft raids took place during the day. Unfortunately, bombers did not always quite hit their target, and areas like Poplar were often damaged by bombs that fell just a little bit short of the docks. The bomb that caused this disaster did not hit its target. It was probably aimed at the nearby Isle of Dogs, as some British destroyers were berthed there. On the 13th of June 1917, on the first day of German aircraft bombing in daylight, this stray bomb hit a Poplar primary school close to the dock targets, causing one of the saddest tragedies of the First World War. The school, Upper North Street School, had three floors of classes. Girls were on the top floor, boys on the second and infants on the ground floor. The bomb made a direct hit, scything through the top of the building and down to the ground floor where it exploded. Most of the 18 children who died in the raid were from the infant class and were between four and six years old. It is thought that around 37 other children were injured in the blast, some of them badly. Teachers and other school staff bravely shepherded their classes to safety afterwards and many of the children watched as the bodies of their classmates were then carried out of the building. The disaster struck at the hearts of the entire country, but was felt most deeply close to home. One young survivor of the blast described his shock the next day when the school’s headmaster read the register – this figure of authority wept openly every time he called out a name and no answer was given. The school’s caretaker, Benjamin Batt, had to carry out the body of his son Alfie and it is thought that the shock was too much for him. He died in November that year, never having got over the death of his young son. London saw one of its largest funeral processions a week later when the victims of the raid were buried. The public, much affected by this tragedy, sent over 600 wreaths and King George and Queen Mary sent a personal message to be read out at the funeral service. The service itself was held at Poplar Parish Church, but it was led by the Bishop of London. Three of the children were buried in private graves, but fifteen were interred together in a mass grave at the East London Cemetery. The last coffin in the funeral procession is reputed to have contained pieces of bodies that could not be identified. Local worthies set up a fund after the funeral to give the mothers of the children who had died and some of the children who had been most affected by the blast a break away from the area. They were sent to Maidenhead for a couple of weeks to stay in holiday cottages. There is a monument to the children who died in the Upper North Street School disaster in the cemetery in which they are buried. There is also an official war memorial on the site itself, which lists the details of the disaster. It has a photo of the graveside monument and a letter from Queen Alexandra. You can also see a memorial to the children who died in Poplar Recreation Ground. The money for the original memorial was funded by donations from the general public. It raised so much money that part of the money was used to fund a bed in a local children’s hospital and one in a home for crippled children in Hampshire. The Upper North Street School disaster was not the only tragic bombing accident in the East End at a school. In the Second World War, a stray bomb hit South Hallsville School in Canning Town. This bomb, according to official figures, killed around 77 people. It is now believed that almost 600 people died when the building was destroyed. The school was being used as a makeshift shelter for local residents during a period of blitz bombing but was turned into a pile of rubble when a bomb hit it before they could be evacuated out of the area. I’m disappointed to have missed the centenary of this dreadful act – I visited the area during 2012 and hoped to be able to visit again. Anyway I decided to look it up following the centenary of the end of WW1 this weekend. My mum (Olive Clayson) was the youngest of 11 children and was born in 1928, eleven years following the disaster. She attended Upper North Street School prior to the start of WW2. However, Mum’s eldest (or second eldest) sister was Vera Clayson who was only 4 when she was killed at the school and of course would have been my aunt. The Clayson family lived at 23 Market Street, which was eventually renamed Cordelia Street until the blitz of WW2. The family apparently did a ‘moonlight flit’ over to Wembley to avoid the bombing and Mum was evacuated to Oxford to live with a Mr & Mrs Clemence. Sadly, I lost my mum in June 2004, but around 10 years ago my son, who was an apprentice plumber helped install a heating system at a school called the Mayflower. One thing he noticed was a plaque in the reception area commemorating the disaster and he told me about it. I then told him the story of of the bombing the name change to The Mayflower School and he went pale and sat down. My mum talked about a considerable upsurge in conscriptions by young men in the wake of this disaster. Another outcome was King George V the House changing the Royal Family name from the House of Saxe-Coburg and Gotha to Windsor. Of course, the name Gotha shared the same name as the aircraft that dropped the bomb on the school. My Nanny’s sister, my great auntie was one of the infants that sadly died in this bombing. She was only 5 years old – Alice Cross. I attended Upper North Street School from 1934 until the outbreak of war in September 1939, when my sister and I were evacuated to Oxford from there. We lived in Ricardo Street, which was very different in those days when compared to now. I remember my teacher, a Mr Robinson and the Headmaster at that time, Mr Lacey. I have a picture that was taken of class 4b and can name most of the boys that are in it; Hood, Benson, Giles, Joey Pugh and many more. My uncle Jack Brown was born in 1910 and was seven when the bomb dropped in 1917. He was in his class and remembered the explosion but not the noise of it. His father, rushing there from his work at the East India Dock when he heard of the disaster, saw a line of dead children laid against the school building when he arrived there and thought he recognised my uncle’s boots sticking out from the covers that were placed over them. Overcome, he could stay no longer and went home to tell his wife what he had seen. My uncle though, had survived, and was brought home by a teacher. He remembered his father looking at him and walking past him into their backyard, where he immediately put his head into a bucket of cold water. His mother, distraught, ran to him and as she came closer one of her shoes came off. She reached down and grabbed it in her hand and continued to run. These were memories that stayed in my uncle Jack’s mind until he died in 2008. I still remember the school with great affection. Lusty Lloyd Loom had a furniture factory in Augustus Street, which in those days was just off Ricardo Street and I, with my mates, would jump onto the back of the big wheeled containers that were attached to steam-driven traction engines that pulled them. We could get free rides to and from North Street by this method and it wasn’t unusual to see about five or six boys hanging there on their way to school. Robert Putt. According to family legend, my Great Aunt Kitty (Catherine Strawson) should have been in the ground floor class in Upper North Street where the bomb exploded, but was off sick, and my Grandmother (Marjorie Chilvers) was in a class on an upper floor which the bomb passed through killing a kid as it went. Not sure how much of this is true. Found this page when checking to see if anything was happening for the centenary. Hi Malcolm, Tony Bareford from across the Pond, Arizona U.S.A.
Leonard C. Bareford was my Dad’s brother, Henry E Bareford. Dad was sick, he missed school that terrible day the school was bombed in Poplar. There was a picture that was in a newspaper, where it showed a woman and young boy holding hands, overlooking the bombed out school, this was supposedly, my Nan and Dad. Nan had a fish and chip shop #10 Grundy St. Poplar. This shop was blown up in WW2. Still have some cousins in the area. Last trip home took the Wife to the Memorial and said good by to Uncle Leonard, gettin’ old. Did stop at the new pie and mash shop, luvly. Lisa, I’d love to chat to you about Dolly Stimson. I work for a television production company – we’re currently making a history series in which we feature the bombing of Upper North Street School. I’m in touch with Stan Kaye and various people who’ve looked in to the event, and who’ve tracked down descendants. I’ve also spoken to someone who is distantly related to Dolly’s brother, Robert, who was killed. I also have a letter that Dolly wrote to someone researching the history, back in the 1980s, in which she related her memories. I’d be really grateful to get in touch with you if possible? If you’re happy to chat, my direct line is 02070656932. Hi – Thank You for the information about Upper North Street School – I am a Volunteer at Stow Maries Great War Aerodrome & our Museum is currently making some Dioramas to the Great War & the School is one of them – the exhibition is due to be finished by Easter 2016 & then open to the Public. Hello Dave, thank you for your kind comment and the Facebook page link, very interesting. Really good to see many people actively telling the stories of our recent history. I had family in Maldon for years so know the area well. Hi Malcolm – I have just had a long chat this evening to Stanley Kaye about the Upper North Street bombing & he has a mass of information which hopefully we – at the Aerodrome – can draw on. – If You are ever in the Maldon Area please drop into ‘Stow’ for a look round.